An investigation of the Zoot suit phenomenon in the United States in the 1930s and 40s. “A killer-diller coat with a drape-shape, reat-pleats and shoulders padded like a lunatic’s cell”. “These youths refused to accept the racialized norms of segregated America. With their flashy ensembles, distinct slang, extra cash (generated by a booming war economy), and rebellious attitude, pachucos and pachucas participated in a spectacular subculture and threatened the social order by visibly occupying public spaces." In previous issues of Organise! we have focussed on various youth movements that developed in the 20th century and in one way or other were expressions of dissent and disquiet with the present system. We have taken looks at the Edelweiss Pirates, the Zazous of France and the Schlurfs of Austria. In this issue we look at the zootsuiters , a style and movement that developed among black and Hispanic Americans. The zoot suit appears to have developed around 1935 in nightclubs in the black area of Harlem in New York, at Sammy’s Follies and the Savoy Ballroom. Zoot suits exaggerated the smart 1930s look, and were worn by young blacks as an expression of personality in a world where social recognition, and a limited one at that, could only be gained through being a musician, boxer, and in a few instances, as a writer. The determination to have a smart appearance despite poverty, as a sign of pride and self-respect, has a long tradition in the working class. Musicians, whether in blues or jazz, made a big effort to be smartly turned out. Musicians, among them l Louis Armstrong and Dizzy Gillespie, always dressed in immaculate suits and were called “The Gentlemen of Harlem”. The zoot suit took this notion of gentility and immaculate clothing three steps further, upping the ante with jackets with huge shoulders and trousers pegged down to the ankles. So the zoot suit was more than an exaggerated gentility, more than a fashion statement. As Stuart Cosgrove notes in The Zoot Suit and Style Warfare: “These youths were not simply grotesque dandies parading the city’s secret underworld, they were ‘the stewards of something uncomfortable’ a spectacular reminder that the social order had failed to contain their energy and difference….The zoot suit was a refusal; a subcultural gesture that refused to concede to the manners of subservience”. It was a symbol of pride of ethnicity. The zoot suit fashion began spreading from the black urban areas to the Mexican-American youths –the pachucos-of Los Angeles and other towns on the West Coast, who further popularised the look. The Mexican poet and writer Octavio Paz wrote in his The Labyrinth of Solitude that : “The pachucos are youths, for the most part of Mexican origin, who form gangs in southern U.S. cities, they can be identified by their language and behaviour as well as by the clothing they affect. They are instinctive rebels, and North American racism has vented its wrath on them more than once.” The pachucos were second-generation working class immigrants. They were alienated by the racism around them, whether at school, in work or on the welfare line. Rather than hiding their disgust with society, they adopted a swaggering and proud posture. Like black zoot suiters they paraded their hostility and difference. It should be remembered that both pachucos and pachucas held down several jobs at a time, and had to save for many weeks to acquire their expensive and immaculate apparel. In addition, the style spread to Filipino-American youth. In the 1940s, they were banned from white dance halls in California and began to frequent dance halls with a black and Hispanic clientele, some of them picking up the zoot suit style, as did some Japanese-American youths. The wearing of the zoot suit became more and more difficult with the outbreak of war and the introduction of wool rationing by the War Production Board in March 1942, with a 26% cut in the use of fabrics. This turned the sporting of zoot suits into illicit acts. However they continued to be made by underground tailors. Zoot suiters became seen more and more as anti-patriotic. The war mobilised over four million civilians into the US armed forces. At the same time five million women entered the wartime labour force. This caused big changes in family life, with the erosion of parental control. There was a marked increase in juvenile delinquency. Because of parents being on active military service or in war work and with an increase in night work because of the demands of the war, many young people were able to stay out late on street corners, or in bars and cafes. The wearing of the zoot suit was now in very marked and polarised opposition to servicemen in uniform. Zoot suit wearers were seen as both delinquents and as thumbing the nose at rationing. In early June 1943 servicemen on shore leave in Los Angeles began to attack pachuco zoot suiters in the street. As a result sixty zoot suiters, rather than their attackers, were arrested by the police. The police began to patrol the streets, whilst rumours circulated of servicemen forming vigilante groups. More and more zoot suiters were attacked and stripped of their outfits. Some drunken sailors ran riot through a cinema, dragged two pachuco zooters on stage, where their suits were stripped from them and urinated on. The confiscated suits were burnt on bonfires. In addition, in a move that reflected what happened with Hitler Youth attacks on Schlurfs and Vichy youth organisation attacks on Zazous, zoot suiters had their ducktail hairstyles shorn by rampaging, soldiers, sailors and marines. 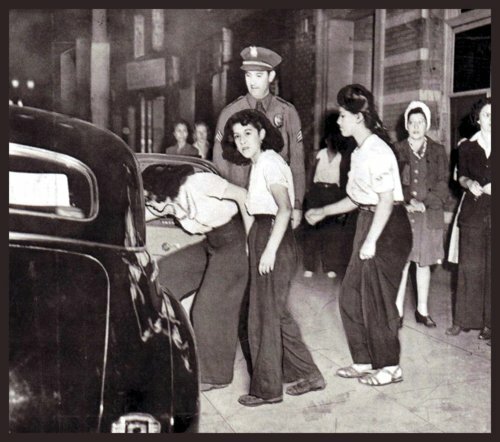 In the second week of June, Pachuco youths retaliated by slashing a sailor, whilst a policeman was run over when he tried to flag down a car-full of zoot suiters. Pachucos stoned a train load of sailors, fights broke out daily in San Bernardino, and vigilantes assembled in San Diego and began to look for zoot suiters. Meanwhile a young Mexican was stabbed by Marines. The riots accelerated with a police special officer gunning down a zoot suiter in Azusa. Pachuco youths were arrested for rioting in the Lincoln Heights district of LA. Now black zootsuiters became involved, wrecking a train in Watts. Three zoot suit “gang leaders” received widespread coverage in the press after their arrests. Two were Mexican, whilst the other was black. Their arrests confirmed the popular view that most zoot suiters were black or Mexican, that they were of conscription age but were avoiding it or had been exempted on medical grounds. What was conveniently forgotten was coverage of white zoot suiters, of servicemen being arrested for rioting, and the refusal of Mexican-American servicemen to take part in vigilante raids. The riots now spread beyond California to Arizona and Texas. Now media coverage began to concentrate on gangs of women zoot-suiters like the Slick Chicks and the Black Widows. The appearance of the female zoot suiters was linked to the breakdown of family normality . “… There are many indications that the war years saw a remarkable increase in the numbers of young women who were taken into social care or referred to penal institutions, as a result of the specific social problems they had to encounter” (Cosgrove). The Slick Chicks and Black Widows wore black drape jackets, fishnet stockings and tight skirts with heavy make-up, dark lipstick and black eyeliner, with pompadour hairstyles. Some adopted the full zoot suit outfit, challenging heterosexual norms of dressing. Cosgrove again :”The Black Widows clearly existed outside the orthodoxies of wartime society: playing no part in the industrial war effort, and openly challenging conventional notions of feminine beauty and sexuality”. Whilst the disorder died down in Los Angeles in the second week of June, it now spread to Detroit, New York and Philadelphia. Within three weeks Detroit experienced the worst race riot in its history. These were not ”zoot suit roots” as such, but nevertheless they were preceded by attacks on wearers of zoot suits, that is, black youths. The press had from the start instigated and fuelled hostility against wearers of the zoot suit and against Pachuco culture. During the disorder, their daily and false reports further fanned the flames.. However , other parts of the establishment were worried. State senators were concerned about relations with Mexico, just to the south. Senator Downey said that there could be “grave consequences” with the souring of relations between the USA and Mexico, hindering the supply of Mexican labour to help grow crops in California. The Mexican embassy did then raise the matter with the State department. These US administrators were not concerned with the appalling abuse and discrimination against the Mexican-American population, they were exercised by the effect the riots would have on the economy. The zoot suit riots had an important effect on a generation of youth that was socially disadvantaged. They happened whilst the USA was at war and they broke with the official orthodoxy that America was united and was a champion of freedom. They, and the riots in Detroit that followed, were signs of the unrest that was to come in the 1960s when new movements emerged and once again riots broke out. As Himes said, the racial factor was important, but as important was the development of youth cultures that were beginning to reject the norms of capitalist society, inequality, racism, and with the pachucas, sexism and “normal” sexuality. They with the contemporary youth movements in Austria, France and Germany, were to be heralds of new and combative youth cultures that were to emerge in the post-war years. This article appeared in No 82 of the Anarchist Federation magazine Organise! I highly recommend the movie "Zoot Suit" which can be found at veehd.com. Free download! Yes Steven you're right it's an intriguing article. Some more photos would have been terrific! But thanks Natalia. Not Natalia Baldwin who wrote this article but a member of the Anarchist Federation. Natalia Baldwin is cited as a reference.